More than 2.4 million people each year swallow or have contact with a poisonous substance, and more than half of those are children under 6? Nine out of 10 poisonings occur at home? 24 children lost their lives due to poisoning in 2010? Poisoning deaths among 15 to 19-year-olds have nearly doubled in the last decade and the misuse of prescription drugs is an increasing cause of poisoning death in teens today? Keep the toll-free nationwide poison control center number (1-800-222-1222) and local emergency numbers near every telephone. If they suspect poisoning and a child is choking, collapses, can't breathe or is having a seizure, call 911. Otherwise, they should take the product to the phone and call the poison control hotline. 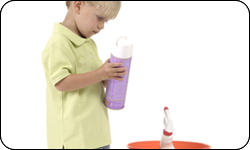 The most dangerous poisons include medicines, cleaning products, personal care products, cosmetics, antifreeze, pesticides and gasoline. These items should be stored in locked cabinets and kept out of sight and reach of children. Check labels when administering medication to children and always use the dosage tool that comes with the medicine. Keep all medicine containers that have safety caps, and take old or expired medication to an Operation Medicine Drop event or permanent drop-box in their area. Never store household and chemical products in food containers (like cups or bottles) and never mix chemical products together, which could cause them to react with each other. Maintain working smoke and carbon monoxide detectors; make sure to test and change the batteries once a month. If their home was built before 1978, have it checked for lead-based paint. They should remove any peeling paint or chewable surfaces that have been painted with lead-based paint. Secure remote controls, key fobs, greeting cards and musical children's books. These and other devices contain button batteries that can cause serious injury if ingested. Educate teens that pain relievers, antidepressants, stimulants and other pills dispensed by a doctor for a family member or friend can be deadly if shared or misused in other ways.